Kissack Adventures: Turk The Carvey!!! I guess I didn't have to drive all the way over the Sierras to find a pretty sunset after all. Once in a blue moon they happen right in my back yard. Everywhere I looked there were magical pink clouds. It didn't last long however. These beauties are pretty fleeting. NOT so pretty OR fleeting was the state of my house upon return. I've never seen so much dust for just four days. Honestly, I really did vacuum before I left. By the time I walked 20 feet across my living room floors, I had to scrape the sand and almond hulls off my feet. Time for a thorough cleaning ... and you KNOW how much I enjoy doing that! I vacuumed, steam mopped and used Bona like my mother-in-law was coming to dinner. I don't have a mother-in-law, but it helps to think that. At long last ... squeaky clean. I wore my slippers just in case I missed a spot or two. I hope that exercise will take care of the muscle cramps I've been getting at night in my legs. There's almost nothing worse than waking up with pain in your shin so bad you have to stand on it for 20 minutes for relief. After two nights in a row, I'm hitting the salt shaker. Way back when I worked at Yosemite National Park, I accidentally ran into a big-time college football coach. Never look behind you when you are jogging. Whatever I did caused a big charlie horse in my calf. After my apologies, he suggested I eat more salt. You know, the stuff that causes heart attacks that you are NOT supposed to consume? I tried it and it worked. So today I'm salting everything I eat. Even the pancakes. 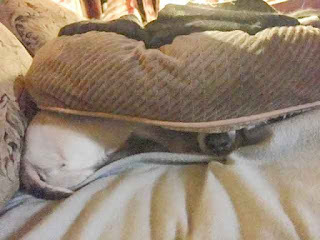 Miss Jessie is still stuck in the time change zone. Instead of sleeping IN her bed, she sleeps UNDER it. Silly girl!! Just in case you didn't remember, Thanksgiving (and therefore CHRISTMAS) is just around the corner. It will be here in a flash. 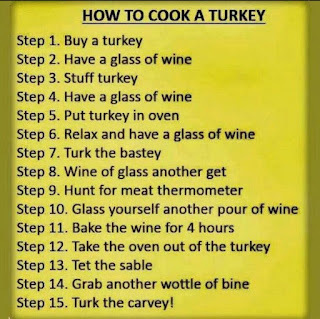 I think I've posted this before, but it's my favorite directions for cooking turkey. It is SO much my grandmother Grace. She rarely ever drank, or at least I never saw her. When she did however, this would be the result. I miss her laugh. In the meantime, I'm still trying to find 2,000 ice cream bars and 75 gallons of ice cream for the Indio Rally. I may just be raiding every grocery store when the time comes. A trip to Costco is in order today for bowls, spoons and napkins. I'm going to try very hard to only purchase things from my list. That never happens so I'll check my bank balance before heading out. Nice sunset for as long as it lasted. 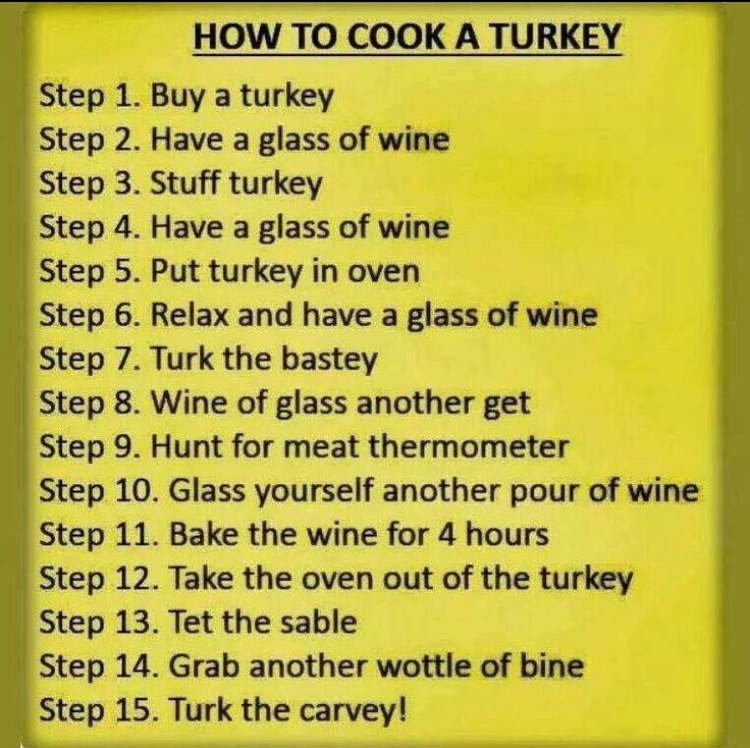 That is the only way to cook a Turkey is it not, helps pass the time. Good luck with the ice-cream hunting. I think I'll try that recipe this Thanksgiving!! What a beautiful sunset. Great catch. The sunset was only there for seconds. It was a lucky catch! Potassium? Bananas are not my favorite unless their are smashed up in delicious bread. Maybe I'll eat a chunk of banana bread!! Dill Pickle Juice helps with cramps too. As for me, I am drinking either Diet Tonic Water and/or a flavored Sparkling Water each day. The Quinine in Tonic and Potassium in the Sparkling Water help with me leg cramps which I get at night because I kick the covers off every night and the cool air causes leg cramps. Oh my gosh NO!! I am NOT a fan of dill pickles, let alone the juice. Maybe sparkling water would work! !